BookFlix is an online eBook service provided by Scholastic, and is available through your public library’s website. 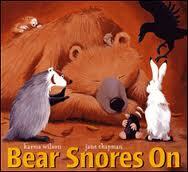 We really enjoy the tree versions of Wilson’s Bear books: Bear’s Loose Tooth, Bear Wants More, Bear’s New Friend etc. These well-rhymed books tell stories about a brown bear and his woodland companions; in this one, bear sleeps through howling wind, the crackling of a fire, the popping of popcorn and the sounds of merrymaking. Bear only awakens when a flake of pepper flies up his nose and he sneezes himself to consciousness, at which point he laments that his friends have been enjoying themselves without him. There is no interactivity, but light animation like snow falling and dancing creatures add interest to an already adorable book. BookFlix pairs fiction books with non-fiction books on a similar topic. The non-ficition pairing for this book is A Bear Cub Grows Up, which was more enjoyable to read than I expected. I viewed both of these books on a laptop, which made the experience less let’s-cuddle-up-and-read and more let’s-learn-about-bears. The interface is a little clunky, and you have to use the mouse to navigate, which is harder for little hands to master than swiping on a tablet. That said, the text is clear, the pictures good and there are vocabulary words highlighted within the text that you can hover over, and the definition pops up, along with an ear icon that you can click on to hear the word pronounced. The Read Along function can be turned On or Off at any time and the volume control is right below the text (the sounds quality differs from book to book). Posted on May 13, 2012, in BookFlix, eBook, Review and tagged BookFlix, Karma Wilson. Bookmark the permalink. Leave a comment.